Kid Caviar is a multi-instrumentalist, composer and lyricist from Santa Monica, California. He lived on Oahu’s North Shore from 2010 to 2013 and frequently rides the train between California and Arizona busking along the way. His song “Where we are” is a summer anthem and ode to his beach culture roots. Chris “Kid Caviar” Abbott, acoustic folk rock artist has been touring with bands since the 90s with such acts as Horny Toad, the Blue Kind and Skatemaster Tate. Playing venues from Bangkok to the UK, Mexico City, Rio and across the United States. Aside from that, he’s been pursuing a solo acoustic act that’s been seeping through the cracks throughout the years. 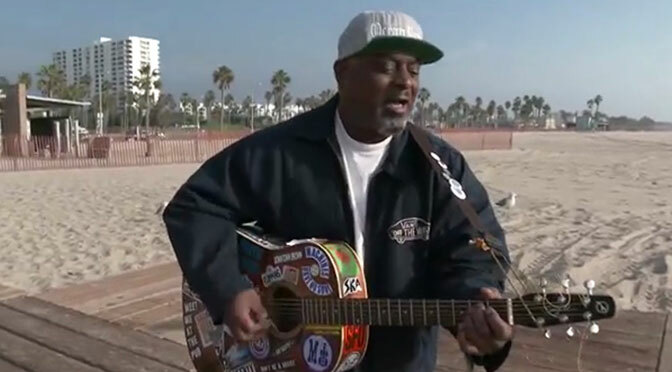 Last year he played 40 open mics throughout the states of California, Arizona and Hawaii. Although he began in such hallowed venues as the Crooked Bar, 14 Below and the Cows End on Venice Pier. Playing for coffee patrons who are not there to see him and just want free wi-fi to write their scripts, provided a thick skin. Some of his favorite spots on his open mic tour were Oak Creek Brewery in Sedona Az, Tiny Town in Forestville Ca, and Jerry’s Pizza Haleiwa Hi. He’s known as the Vagabond Son, the Couch Gypsy and the Crosstie Walker. Check him out on a corner near you.